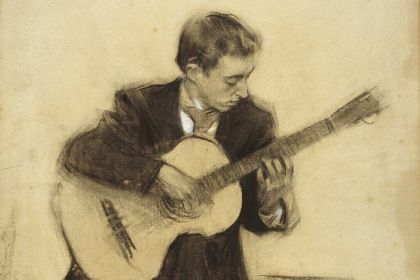 South American guitar maestro Agustín Barrios Mangoré (1885-1944) was born into a large family with seven sons in the small town of San Bautista de las Misiones in southern Paraguay. Inspired by his mother's guitar playing, Barrios began to play the guitar at a very young age. After receiving his training from famed maestro Gustavo Sosa Escalada, Barrios left Paraguay for Argentina for what was supposed to be only one week of concerts, but instead it led him to 14 years of touring over the world with his performances being compared to Paganini for their virtuosity. Barrios composed over 300 works, many of which he attributed to obscure early composers in hope that this ruse would allow for renewed and more serious regard for the forgotten masters. But he made history in a much bigger way, by becoming the first classical guitarist to make a gramophone recording. Barrios has clearly been one of the most underrated composers and players for the modern guitar. After his death, his music was forgotten and overlooked for nearly two decades. Only recently the recognition for his talent has been on the steady increase in the guitar music community. "... as a guitarist/composer, Barrios is the best of the lot, regardless of ear. His music is better formed, it's more poetic, it's more everything! And it's more of all those things in a timeless way. So I think he's a more significant composer than Sor or Guiliani..."